Every day I know where the fish are! Under this plant. 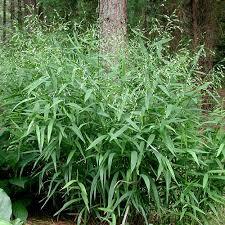 River Oats is a Type of Grass and is Native to the Southeastern United States and Northeastern South America. It is currently a Threatened Species in Pennsylvania and Michigan. River Oats are often found growing in the Woods along Streams or Rocky Slopes. The River Oats plant is very tolerant of Poorer Dry Soils but does mostly prefer Moist Fertile Soil, River Oats start to Bloom round about August to September time, and its Flowers are very showy. There are many other Species, but they have the same needs, but they are usually grown elsewhere, like the Sea Oat and Wild Oats. They can also grow well in full sun to partial shade. The River Oats grass species is named for its oat-like seed heads and its ability to prosper in river and stream banks. This cool season grass, River Oats, grows in clumps, and the seed-heads are in panicles, much like oats. The seed-heads also change color throughout the season, from translucent green to rich brown in the summer and fall. However, if the River Oats grass turns yellow, that means that it lacks nutrients. The River Oats are tolerant of poor soils but would grow better in moist soils. They are easy to maintain, in fact almost maintenance-free, except to keep them under control. Leaving foliage during the winter helps protect the crown from the cold. Once spring comes around, cut back to the ground. River Oats would make a great ornamental plant for your garden. Not only that though, but this plant is also good for erosion control and bank stabilization. When planting this River Oats, remember that it will reseed, so it is best to place in an appropriate location. The River Oats are easily grown in medium to wet, well-drained soil.